At the age of 51, former �America�s Sweetheart� Julia Roberts doesn�t dominate multiplexes like she did in the 1990s. We still see Roberts every year or so, though, and Ben Is Back represented her sole cinematic entry for 2018. Set on Christmas Eve, we meet Holly Burns (Roberts) and her family. One member has been absent for a while, as young adult son Ben (Lucas Hedges) remains estranged due to his drug abuse issues. To the surprise of Holly and others, Ben suddenly returns. This event sets off a mix of dramatic complications. Due to subject matter, I should relate to Back. My older brother shared more than a few traits with Ben, and during those occasions when he�d show up back in my family�s life, turmoil often resulted. In this film�s story, I most connect to oldest daughter Ivy (Kathryn Newton). She shows the most wariness about Ben, a position I occupied in my family � sort of. All of us failed to trust my brother, but I seemed more skeptical than the rest. Ben connects to my brother only in theory, though, as he shows a lot more self-awareness and remorse than I witnessed. That doesn�t make Ben unrealistic, of course � dysfunction isn�t one size fits all � but it gives the story a spin outside of my experiences. Though Back doesn�t replicate my family, I do feel enough connection to assess its theoretical sense of realism. In that regard, the film feels contrived and trite. Despite the basic premise, Back largely ignores the family dynamics. It concentrates on Ben and Holly to the exclusion of almost all else, a factor that leaves the rest of the clan as little more than plot conveniences. If Back investigated the mother/son relationship in a deep, meaningful way, I wouldn�t mind the absence of additional information. However, the story prefers to go down a strange path that doesn�t work. Midway through the film, someone from Ben�s troubled past steals the family dog, so much of the tale follows Ben and Holly�s joint pursuit of the pooch. That seems like a perplexing choice, but it exists because it allows the movie to take us on a tour of Ben�s old haunts. None of this offers a rich character exploration. Instead, it all feels like little more than window-dressing of the public service announcement sort, as the movie tries to show us the depravity drugs inspire in their users. With actors like Roberts, Hedges and Courtney B. Vance in tow, the film enjoys a good cast, but they can�t do much with the material. Hedges rarely comes across as more than a sad puppy dog, and Roberts offers a stock portrayal of the determined mother who won�t give up on her kid. Again, the issue lies more with the screenplay than with the actors. Back fails to give them room to develop into believable human beings, so we�re stuck with them as simple archetypes and not much more. All of this leaves Back as an oddly unemotional enterprise. More of a weepy melodrama than a bracing look at the needle and the damage done, the film limps across its 103 minutes. Ben Is Back appears in an aspect ratio of approximately 2.39:1 on this Blu-ray Disc. The movie offered a positive visual impression. Overall definition seemed positive. Only a little softness materialized, so the movie usually appeared accurate and concise. In terms of colors, Back went for a teal tint that connected to the chilly winter environment. Interiors opted for a light orange/amber feel as well. These appeared fine within the film�s stylistic choices. A character drama wouldn�t seem to be a candidate for a whiz-bang soundtrack, and the DTS-HD MA 5.1 audio of Back fell into expected realms. Usually the track remained oriented toward ambience, so don�t expect lots of sizzle from the mix. Audio quality satisfied. Although didn�t get much score, the music was full and rich, while effects showed nice clarity and accuracy. Speech � obviously an important factor here � appeared concise and crisp. Nothing here soared, but it all seemed perfectly adequate for the project. 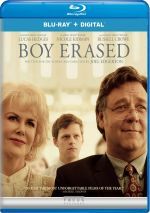 In terms of extras, the main feature comes from an audio commentary with writer/director Peter Hedges. He provides a running, screen-specific look at story/characters, cast and performances, sets and locations, music, photography and related domains. Because he delivers his commentary with an erudite, professorial air, Hedges leaves the impression that he brings us a lot of insights. However, this doesn�t prove true. Oh, Hedges gives us decent thoughts about the film, but he often does little more than narrate it. While this seems like enough to carry us, the end result ends up as a lackluster view of the production. We also find an Image Gallery. A running affair, it shows 32 images, most of which offer stills from the film. It seems like a forgettable compilation. The disc opens with ads for At Eternity�s Gate, Manchester By the Sea, Beast and A Simple Favor. We also find two trailers for Back. 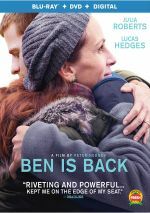 Though Ben Is Back addresses a valuable topic, it does so in a trite TV movie manner. The movie acts more like a PSA than a dramatic narrative. The Blu-ray brings very good picture along with adequate audio and a mediocre commentary. Back lacks emotional impact and becomes a mediocre film.